"Forget your big blue men, Cameron - these little green men are much more exciting"
James Cameron is continuing is plight to turn everything 3D by helping out NASA and equipping its Mars rover with a 3D camera. 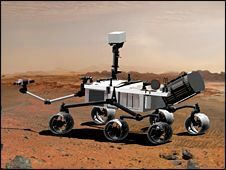 Curiosity - the name of the vehicle which is set to travel to Mars - has a launch scheduled in 2011, but before it jets off the rover is going to get a camera makeover. The people behind the rover's camera, Malin Space Science Systems, have enlisted the help of Cameron who turned Hollywood on to the idea of 3D with his mega-hit Avatar. Cameron will modify the existing cameras – which shoot HD – for 3D filing, using the technology he built from the ground up for Avatar. Speaking about the link-up Michael Malin, from Malin Space Science Systems, said: "The fixed focal length [cameras] we just delivered will do almost all of the science we originally proposed. "But they cannot provide a wide field of view with comparable eye stereo. With the zoom [cameras], we'll be able to take cinematic video sequences in 3D on the surface of Mars. This will give our public engagement co-investigator, James Cameron, tools similar to those he used on his recent 3D motion picture projects." If all goes well, expect 3D footage of Mars to hit Earth sometime in 2011.